Rock Solid PhotoBooth Kit for Stands and Tripods by Tether Tools at Marco Marcucci. MPN: VUB-LOE. Hurry! Limited time offer. Offer valid only while supplies last. The Rock Solid PhotoBooth Kit for Stands and Tripods is a quick easy and inexpensive way to create a photo booth for events wedding or parties. The Rock Solid PhotoBooth Kit for Stands and Tripods is a quick easy and inexpensive way to create a photo booth for events wedding or parties. Designed with the on-the-go photographer in mind the Rock Solid PhotoBooth Kit for Stands and Tripods is designed to serve many photo display needs travel easy and not break the bank. The Rock Solid PhotoBooth Kit for Stands and Tripods is a modular booth setup designed to utilize existing equipment so purchasing an expensive cumbersome use-specific photo booth is not needed in order to offer clients a photo booth option for their events. Simple to set-up and easily positioned in any environment the Rock Solid PhotoBooth Kit for Stands and Tripods can be set up on any existing tripod or 5/8"(16mm) Baby stand and attaches to any VESA compliant TV or monitor. 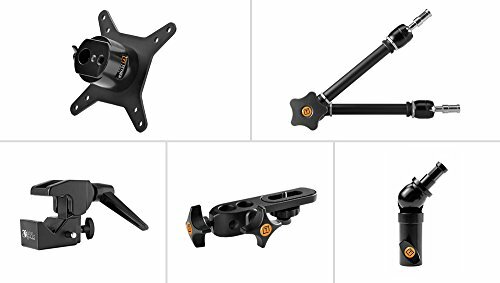 The Rock Solid PhotoBooth Kit for Stands and Tripods contains a Rock Solid VESA Local Monitor Mount for Stands and Tripods, an Articulating Arm, a Rock Solid Master Clamp, a Rock Solid Aero Elbow and a camera mounting platform. The Tether Tools Rock Solid PhotoBooth Kit for Stands and Tripods sets up in minutes. Easily connect any VESA compliant 75x75 or 100x100 monitor (adapter plates available for larger monitors) to the Monitor mount. Once mounted the monitor can easily rotate from landscape to portrait position. Tripod, C-Stand, monitor and photo booth software sold separately. Does not include a tripod, stand, monitor or photobooth software.